Today's July 11th, also known as Free Slurpee Day. jenniever just called to remind me (she's the greatest), so pick up your 7.11 oz little baby cup of Slurpee today! 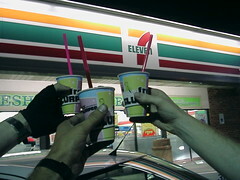 When 7-Eleven finally spreads like a nasty rash across Europe, will they give out free Slurpees on November 7th? That just doesn't seem as appealing to me for some reason, though it's never a bad day for a Slurpee. I once lived off of Powerbars and Slurpees for a good portion of a summer in high school. Speaking of high school, am I the only one really amused by the Rocketboom drama unfolding all around us (it's EMCEE Murduh)? Judging by the coverage out there in the Blogofractal - nope. We've got she said, he said. We've got VIDEO she said, he said. And the rumors fly. Ultimately, here is the greatest Rocketboom ever. If you watch that on loop for an hour while tired, you can feel a higher consciousness reaching through the monitor and slapping your face. Try it. Oh I am so pumped for my free slurpie tonight. Are you a mixer, or do you go for the homogeneous Slurpee? I'm a mixer, depending on what's available. I forgot to get myself a slurpee!